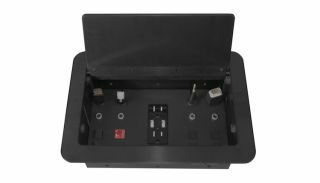 The What: Altinex has launched the new CNK600 Cable Nook interconnect box and the SP2116SC and SP2117SC customizable interconnect plates. Designed for use in boardrooms and conference rooms, the CNK600 Cable Nook improves concealment and storing of multimedia cables and connectors when not in use and provides easier access to those connectors when needed. The SP2116SC and SP2117SC interconnect plates designed for use with the CNK600 Cable Nook provide a wealth of connectivity options, including ports for audio, video, network access, USB charging, AC power, and more. The What Else: The Altinex SP2116SC interconnect plate is a hybrid interconnect solution that allows for a diverse range of connector configurations for audio, video, computer, network access, and AC power. It is designed for use in North America. The SP2116SC includes the UL/cUL listed CNK-IP-200 single-gang, dual-AC power and dual-USB charging module, plus 12 blank snap-in locations that can be customized using a variety of Altinex CM cables. The SP2116SC is also designed to accommodate up to four of Altinex’ RT300 Series retractable cables, in any combination. The SP2116SC is mounted directly to the CNK600 chassis and has mounting holes for retractable cables—eliminating the need for additional mounting hardware. The Altinex SP2117SC interconnect plate is similar to the SP2116SC, but is intended for use in international markets due to the difference in AC power connectors. These markets include Australia, the European Union, and the United Kingdom. There is also an available universal AC power connector. Like the SP2116SC interconnect plate, the SP2117SC has 12 blank snap-in locations that can be customized using a variety of Altinex CM cables as well as the four blank spaces designed to accommodate any combination of RT300 Series retractable cables. The SP2117SC is also mounted directly to the CNK600 chassis and has mounting holes for retractable cables. The Bottom Line: Designed for installation into a meeting room tabletop, the Altinex CNK600 features a black, brushed aluminum finish that blends well with nearly any meeting room décor. To access the cables or connectors, one simply lifts the lid and pulls the desired cable end out. After the presentation, the cable ends are retracted to the Cable Nook for safe storage. Alternatively, the user might also plug cables into the fixed connectors—such as patching a notebook into an RJ-45 Ethernet connector for network access. The Cable Nook’s closed lid also has an opening that allows cables to be used with the lid closed to eliminate distractions during meetings.